• Built-in 2 channels (dual) enabling use in stereo and bridge amplifier applications. • Minimun number of external parts required. 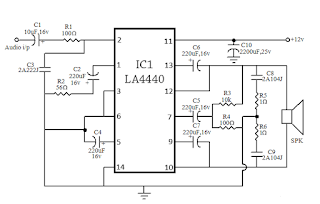 • Small pop noise at the time of power supply ON/OFF and good starting balance. • Small residual noise (Rg=0). • Low distortion over a wide range from low frequencies to high frequencies. • Easy to design radiator fin. • Built-in audio muting function. 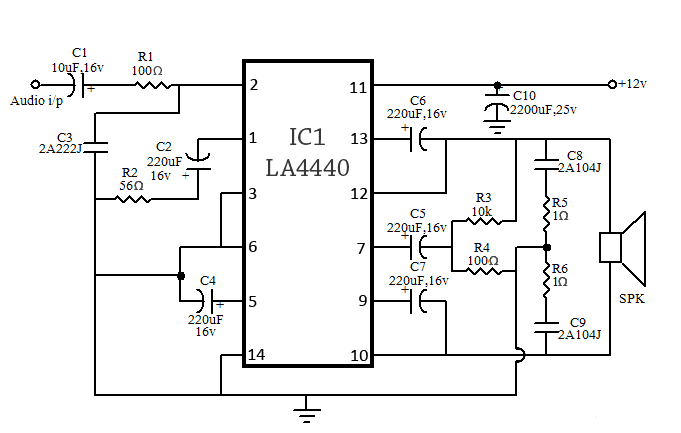 Circuit diagram is for one section of the stereo audio amplifier. It is similar for another section. PCB with components and ready-made kits are also available with us.